This month I’ve been playing with my latest coffee brewer. 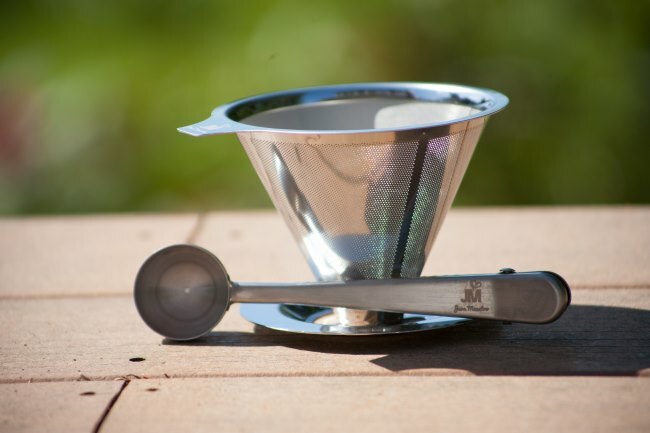 It is a stainless steel pour-over coffee filter made by Java Maestro. 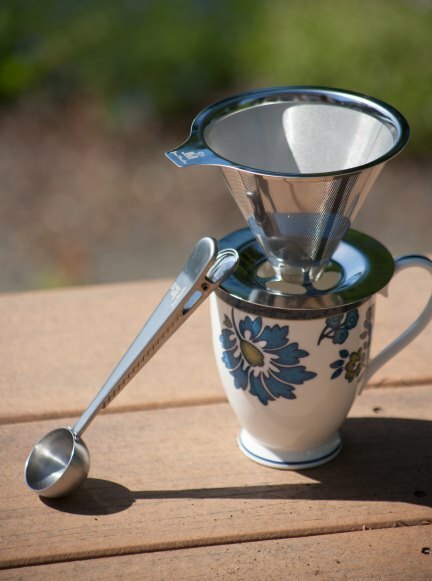 What makes this particular pour over coffee brewer interesting is it doesn’t require a paper filter. The dripper is the filter. There are two benefits of not needing a paper filter. The first is economical. Not having to buy filters ever is one less expense. The second benefit of not having a paper filter is you get all the oils from coffee in the cup. This gives the coffee a richness that is sometimes sacrificed with paper filtered coffee. However, the benefit of paper filters is they keep all the coffee grounds out of the cup, which results in a cleaner cup of coffee. 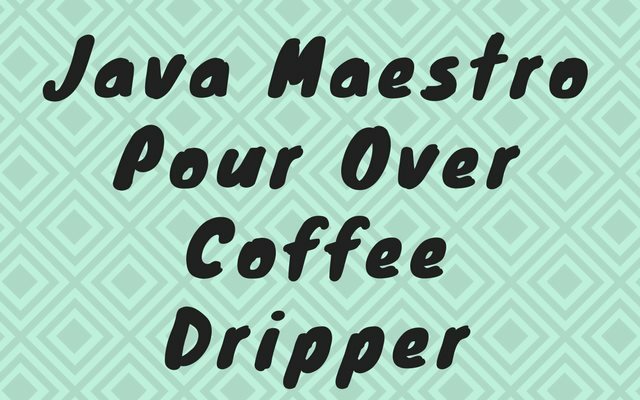 The Java Maestro Pour Over Coffee Dripper does such an excellent job with filtering that not only does it make a rich cup of coffee, but a clean one as well. 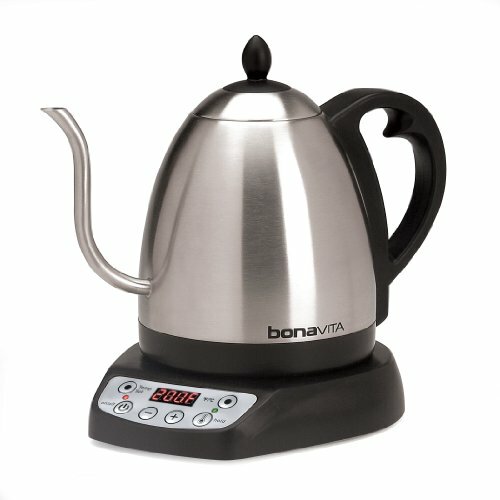 For this brewing method, I strongly recommend getting a Bonavita 1-Liter Variable Temperature Digital Electric Gooseneck Kettle. As with any pour over coffee, you are responsible for making sure the coffee is saturated with hot water. Being able to control the water flow will make that task much easier. The Java Maestro is made of stainless steel. Give it a quick rinse of hot water from the sink before you start brewing. This will preheat the dripper and minimize heat loss. The Pour Over Coffee Dripper is a one mug at a time brewer. The only question is how big of a mug you’ll be using. If you are not weighing as you add water, there is a risk you could add too much water and cause a mess. There is a tiny visible hole in the brewer that you can view the progress of your pour over. Not ideal. A glass mug or jar would be a better approach. 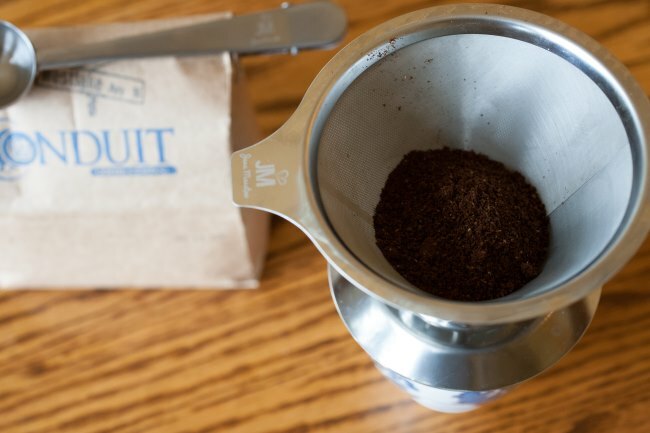 Included with the Java Maestro Pour Over Coffee Dripper is a scooper that also serves as a coffee bag clip. For a single 12 ounce mug use 3 scoops. 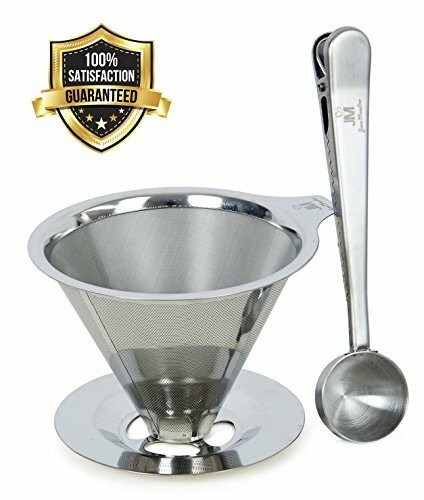 If you lose the scooper or want to use a gram scale, I used 20 grams of coffee and 310 grams of water. That works out to a 15.5 to 1 ratio (water to coffee). With the kettle, you’ll be adding coffee in the 195 F – 205 F range. For more information about brewing temperature see section #2 in the article Hacking Dark Roast – Tips on Brewing a Better Bold Coffee. For the initial pour, add just enough water to cover the coffee grounds and allow them to bloom. For those weighing, this works out to about double the weight of the ground coffee. So if we are using 20 grams of coffee, the initial pour will be 40 grams of water. Let the coffee sit for 20 seconds and then continue pouring the remainder of the water. The water will be poured slowly in a circular motion. Even and smooth. Once all the coffee has exited the brewer, you are done. Enjoy your coffee. Empty the used grounds into a compost bin or set aside for your gardening needs. You can wash the filter with hot soapy water. It is also dishwasher friendly. 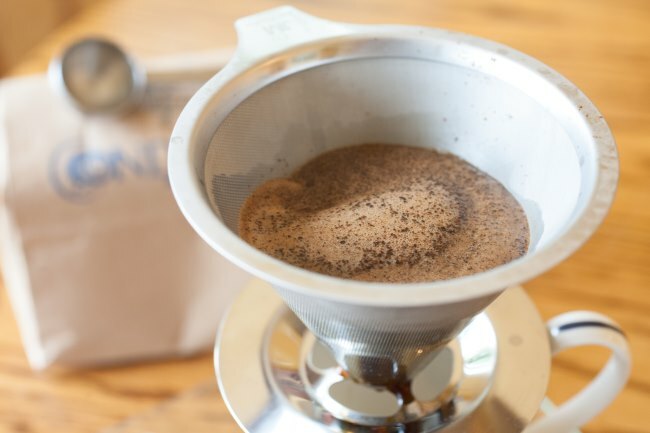 While playing with the Pour Over Coffee Dripper, we discovered the filter was so good that it could be used as an additional filter for other coffee brewing methods. 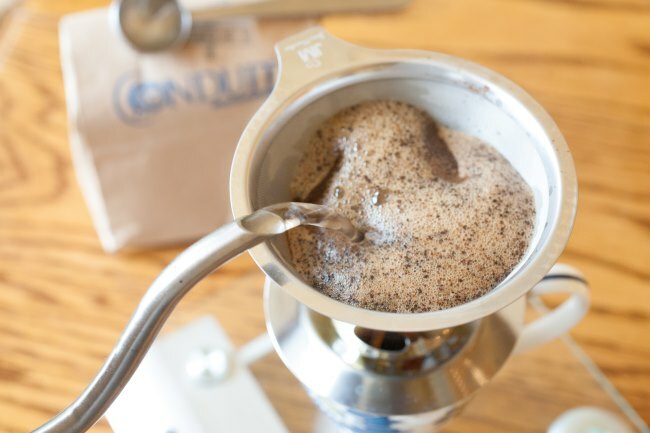 Full immersion brewing methods such as the French Press or some cold brewing methods sometimes have a little grit, which are those loose grounds that sneak past the filter. 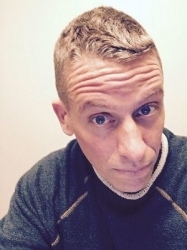 Using the Java Maestro as an additional filter will improve the flavor of your French Press and Swedish Egg Coffee. Coffee Brewing Guide – INeedCoffee guide to several coffee brewing methods. Disclosure: INeedCoffee was sent this product at no cost.